Growth is an important factor which matters a lot for aquatic species. Better health and growth are gained when the nutritional value in the body are in adequate quantity. A nutritionally balanced diet must include a sufficient amount of amino acids, vitamin, and minerals that help in better health and growth. Any kind of deficiency of this decrease the FCR and slows the growth and make the body more prone to different diseases. In aquaculture farming, most of the nutrients are left behind due to poor water quality and stability of the feed. Some of the reason which makes the feed unstable is due to the presence of toxin and acidity of the water. This is the first thing which must be removed with the help of aquaculture toxin binder For enhancing health and growth we use external growth promoter supplement which helps in better growth. We should use “Aquamin” a stabilized combination of essential minerals, vitamins, antioxidants and amino acids for better growth. 1. 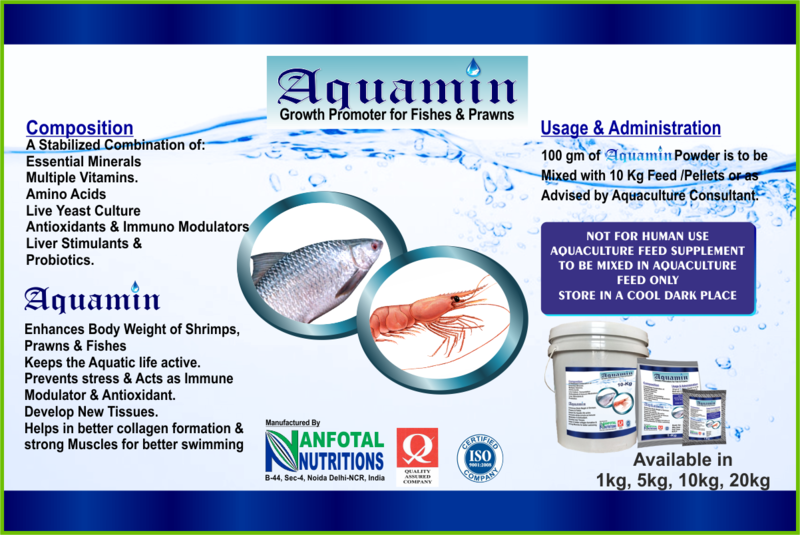 Helps in enhancing body weight of shrimps. 3. Provide relief from stress. 4. Helps in the development of new tissues and collagens. 100gm of Aquamin powder is to be mixed with 10Kg Feed/Pellets.